This knot is a curiosity that often results from tying the Ian Knot incorrectly. Twisting the starting loops in the wrong direction results in a knot with the ends crossed within the knot. It seems more secure, but can easily fall apart. Tie a Left-over-Right Starting Knot as shown, then double each lace back on itself, exactly as is done with the regular Ian Knot. Unlike the regular Ian Knot, the left (yellow) loop is formed by rotating the loose end behind while the right (blue) loop is formed by rotating the loose end in front. Here's the crucial difference: The left (yellow) loop, which would naturally end up behind the right (blue) loop, is instead crossed back to the front, restoring it to the exact position that it would be in for the regular Ian Knot. With everything back in position, this move is identical to that of the regular Ian Knot, where each hand uses the two fingers inside its own loop to grab the loose end of the other hand's loop. This step, again identical to that of the regular Ian Knot, sees each hand releasing its own loop and pulling the loose end of the opposite loop through its own. The only noticeable difference is the lace ends, which cross over each other in the middle of the knot. When pulled tight, the result is a perfectly symmetrical knot just like the regular Ian Knot with an extra crossover of lace ends in the middle. With practice, this can be tied almost as quickly as the regular Ian Knot. The finished knot looks very similar to the regular Ian Knot except for the additional crossover in the middle of the knot. Just as the Ian Knot uses the same core technique as the traditional "Tom Fool's Knot" (which appears in the definitive reference The Ashley Book of Knots as both #1141 and in more detail as #2534), the Crossed "Ian Knot" uses the same core technique as the traditional "Handcuff Knot" (which in turn is shown as #412, #1134 and #1140). This knot is generally used to make "handcuffs" from a length of rope. The Crossed "Ian Knot" could be described as a more intricate variant of the Handcuff Knot. 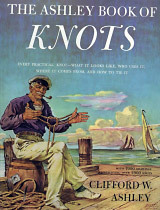 Is It A Worthwhile Knot? "After the Handcuff Knot has been drawn up snugly, each end may be half hitched around one of the loops to render the knot secure." In other words, without this final step, the knot is not secure. User-controllable animation of the Crossed Ian Knot sequence. The regular Ian Knot differs only in the way the loops are rotated. More secure knot that is also based on the regular Ian Knot. Even more secure knot that is also based on the regular Ian Knot.